» What does the Murakami say? #2: Reading your Murakami Open Your Hands Wide (Versailles print) and I met a Panda family. So you’ve opened up your new Murakami to find a pleasant surprise, Japanese characters! The text adds a nice nuance to a Murakami print; however, there will come the day when someone admiring your print suddenly asks you what the writing means! You could just make something up, but now Sugimoto68 brings an alternative–a translation of your Murakami! Now you can impress your fellow art aficionados with your Japanese knowledge and Murakami insights! 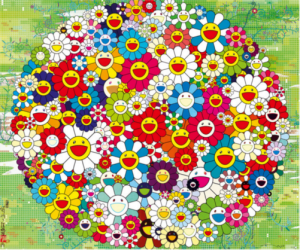 This article continues the What does the Murakami Say series. The first reading guide ambitiously introduced Poka Poka, although the last bit of text stubbornly refused to succumb to interpretation. Part 2 will make up for the prior shortfall by translating not one, but two Murakami prints! 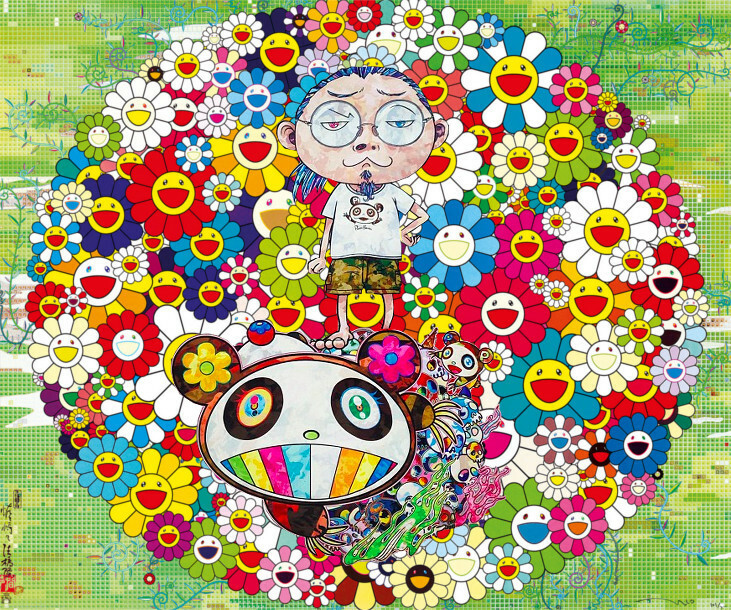 Murakami created Open your hands wide as one of the major works of his 2010 Château de Versailles exhibit hosted by Galerie Perrotin. You can see some of the work on video and hear Murakami rant about the lack of respect he gets in Japan here. Murakami released the extra large Open your hands wide print on August 2010. The text appears on the lower left side of the print. Almost all of the characters match those on Poka Poka, which also appeared in the same exhibit. The initial two characters read as Hokkyou. It is a buddist title or rank for monks and later, artists. The final character is his name, Takashi. 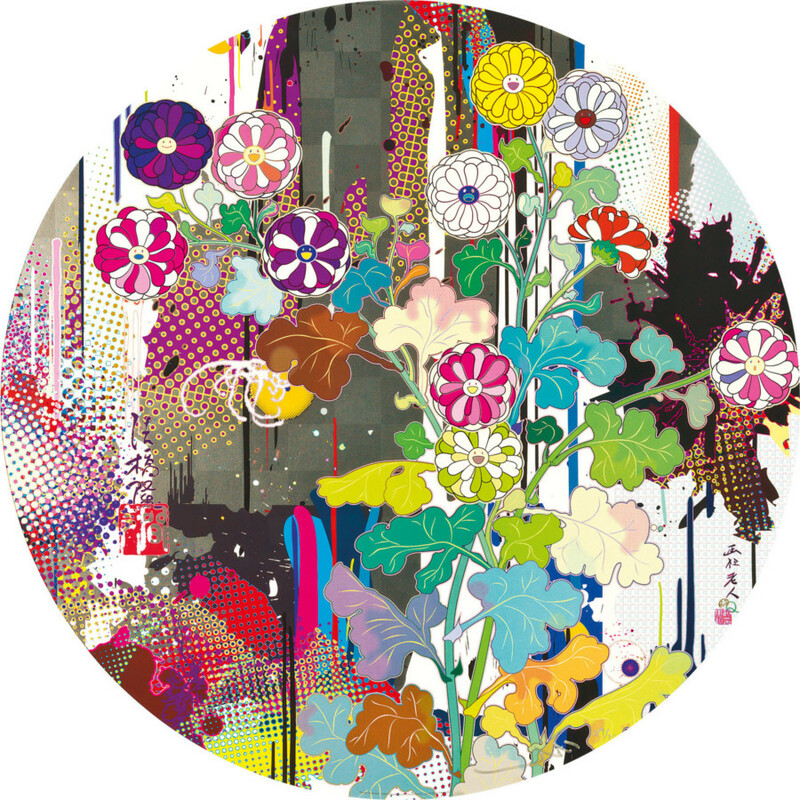 Since Murakami introduced these characters prominently on his Kansei prints, some interpret the use of the title as inviting comparison with the artist Ogata Kourin 尾形光琳. Of course, we could also consider the use of the title as a homage or tribute to Ogata, just like in Murakami’s homages to Francis Bacon and Yves Klein. Admittedly, attaching the title to his own name may cause many to lean towards the haters’ interpretation. In Japan, historically famous artists tend to be referred to by their given names, consider Hokusai 北斎, or Soseki 漱石, so Murakami’s use of solely his given name may feel like a bold move–– but then again Murakami is more famous than Kourin, right? This text reads from right to left as Kansei. Kan means “stream” and sei means voice, so it could be translated as voice of the stream. 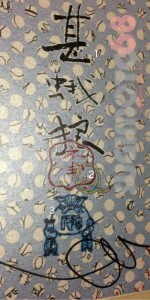 It says “Kaikai Kiki” in a very stylized way. The first two characters represent the name. The third character indicates reduplication of the prior characters. The end result reads as恠恠奇奇 Kaikai Kiki, Murakami’s lovable characters and company’s namesake. 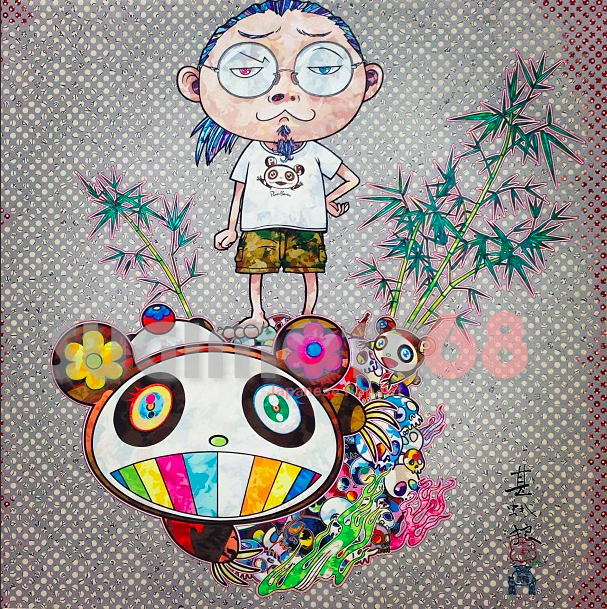 恠崎々Kaikai Kiki has appeared on several different Murakami prints starting with the Buddha series in 2007. The text reads from right to left as Takeshi-shi. It’s Murakami’s name with the address term –shi attached. –Shi could be interpreted as “Mr.”, but more accurately it is a suffix that marks a title of respect, so the title applies to Murakami’s recognition as a professional artists. The mystery seal! Since this seal features on two works introduced at Versailles, Open your hands wide and Poka Poka, perhaps it has some connection with the exhibit? I Met a Panda Family was released in the summer of 2013 as the second print in the latest My First Art Series. 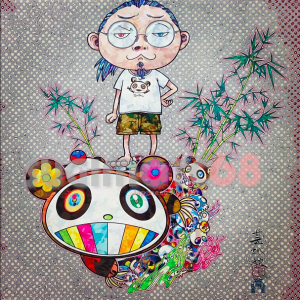 The print features for the first time in a Murakami offset print, his Louis Vuitton panda and baby panda! Panda contains different text than Open your hands, along with the mysterious “Q”. The “Q” also appears on the Kansei Abstraction print, but what in the dickens does it mean? The topmost three characters read as zin-ga-ro. This refers to the name of Murakami’s Nakano Broadway gallery, Hidari Zingaro. Hidari Zingaro was an appellation given to artists with great skill during the Edo era. For example, Utagawa Kuniyoshi occasionally received the alias. In his introduction to the gallery Murakami breaks down the name Zingaro via sound symbolism to connote the fusion of ‘gypsy’, ‘moth’ and ‘wolf’, to show how the word perfectly represents complete artistic freedom. Additionally, Hidari means ‘left’, so Murakami sees the name marking an anti-social stance. The characters read as 神 or ‘god’. The word ‘god’ has more of the sense of ‘deity’ since it typically refers to multiple gods. 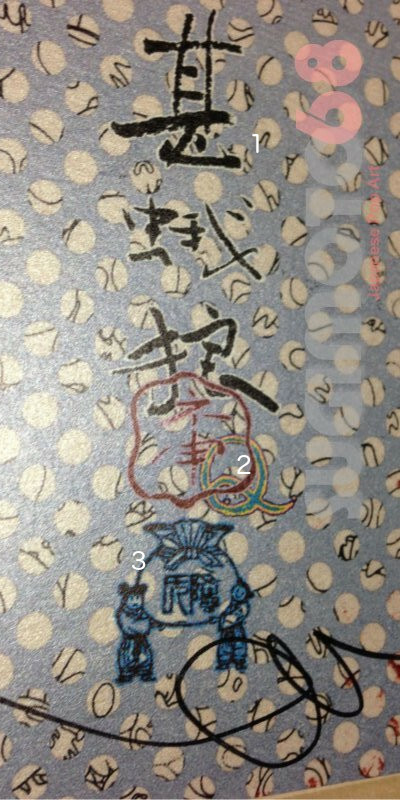 Murakami partially superimposes the mysterious ‘Q’ over the god text. Perhaps Murakami intentionally interpolates the Q, which can signify a question, so as to set up a question “god?” to create a very confounding reference. The bag (full of money?) is the same as on the Poka Poka and Open Your Hands Wide print. This is the first appearance of this stamp. It has an elaborate version of Murakami’s name on it. This exercise in reading Murakami prints says only one thing for certain­­––Murakami really likes to put his name on his prints! Besides that point, the side jokes/embellishments on his prints demonstrate the spirit of play and whimsy in even his most stately of works. May the Q be with you! What does the Murakami say #1: Reading your Murakami Poka Poka Warm and Sunny!